Do you feel hyper, on edge, scattered, moody and hungry for most of the day? You may want to consider eating less sugar. On April 9th, I made a 3-week commitment to eat less sugar because I was feeling too addicted to it. I wanted to eat cookies for breakfast. I was meant to have NO sugar but I failed last night when I ate a large piece of chocolate cake that my son made. It was his first cake and I wanted to be supportive. See what I did there? I came up with a great excuse why I had to eat that cake. Never mind the cake. It was rich and delicious but it’s gone. Now, I want to share some of my strategies for eating less sugar. Not NO sugar but LESS. We all know that our foods are too sweet but there are ways to get away from refined sugar – yes, I’m talking about refined sugar, the white stuff. Having less or no sugar does not mean you can’t have anything sweet. I think some people get confused by that. If you replace refined sugar with other sweet foods, like fruit or honey, the ride will be much smoother. But remember, they both have fructose in them so don’t over do it. Eat a decent protein-based breakfast. I love to have free range scrambled or poached eggs on one piece of grain or wholewheat toast for breakfast. Trying spreading the bread with avocado instead of butter for a nutritious and delicious change. 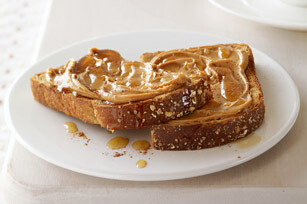 If I’m pressed for time, just a thick piece (or 2) of toast with sugar & salt-free peanut butter will do the job. Winter is fast upon us here in Australia so I’ll soon be having oatmeal or quinoa porridge with dates, nuts, seeds and banana. Drinking water not only hydrates your body, aids bowel movements and gives you an internal wash, it keeps you full. Aim for at least 3 litres a day. Add lemon or apple cider vinegar for an added boost. As well as water, I find drinking more tea (unsweetened) helps curb my cravings for sugar. For me, sugar consumption is linked to emotional eating, procrastination and boredom. Stick to herbal teas like: rooibos, peppermint, ginger, chamomile or any caffeine-free teas. You don’t want to replace your sugar addiction with a caffeine one or insomnia. There are myriad forms of sweeteners today. I use coconut sugar, raw honey or rapadura sugar if I have to have it. Be careful of alternatives like commercial honey, agave or stevia. Stevia has a chemical taste to it (in my opinion) so try it before you spend lots of money on the powdered version. Agave goes through a process that basically turns it to something similar to high fructose corn syrup and store-bought honey gets heated to high temperatures that renders it toxic. Please stay away from artificial sweeteners. They are poison to your body. Be prepared. Avoiding refined sugar means eating less processed foods and to do that, you must plan your meals and snacks. If you don’t, it’s much easier to sway towards to boxed dinner or a high-sugar snack for afternoon tea. Have a prepared salad, cut-up veggies, nuts & seeds; hummus & guacamole dips; crackers (check the ingredients for sugar) and cheese on hand to snack throughout the day. When planning your meals, keep it simple: protein, vegetables and a starch like potatoes or rice if you must. Pasta is a quick and easy meal, just be wary of store-bought sauces – they almost ALL have added sugar. Sorry, but if you want to make a real change to your sugar intake, you will have to give booze a miss. Not forever, if you don’t want to. I go through cycles of drinking and not drinking. When I want to make conscious decisions about my health and diet, I always get on the wagon. Like I said, it’s not about forever. It’s more about changing your mind-set and taking a break. If you must have a drink, say at an event or party, go for spirits like vodka or gin. Try it with sparkling mineral water and lemon or lime. This makes a good low sugar alternative to beer or wine. By now, everyone out there has heard of the paleo or caveman diet. I’m not a subscriber but I understand some of the benefits. They eat more animal products (great source of protein), more fresh produce like vegetables and fruit, honey, nuts and seeds and they eat little to no processed foods. If you stuck to this eating regime, there is virtually no option to have refined sugar in your diet. This article on Harvard Health Publications says protein is an important part of our diet. It’s used for building and repairing cells, muscles, and skin. I’m not one for eating huge amounts of meat, especially red meat, but eating nuts, free range chicken, eggs, legumes, fish and sometimes dairy products are a good way to get your daily intake (which is recommended to be %15 of your food). Click here for paleo recipes. Are you trying to reduce your sugar intake? Do you have any other suggestions to add? Please share! Categories: Food, Health, Recipes | Tags: caveman diet, how to eat less sugar, paleo, paleo recipes, sugar free | Permalink.